If you look at the Downtown Traffic Map, as well as historical pictures of the Birmingham L&N Station, you will note that it is located on 20th Street, at street level. The Map (c.1926) precedes by several years the major grade separation of the downtown streets and the "railroad reservation" (c.1931). As the City grew and rail traffic increased, there was an ever stronger movement by the public for the development of "subways" and "viaducts" to separate rail and street traffic. This location would eventually be rebuilt to separate the street and the tracks, in the 1929 Grade Separation Project. Today this site is the location of the 20th Street "tunnel", or as it was called then, "subway". 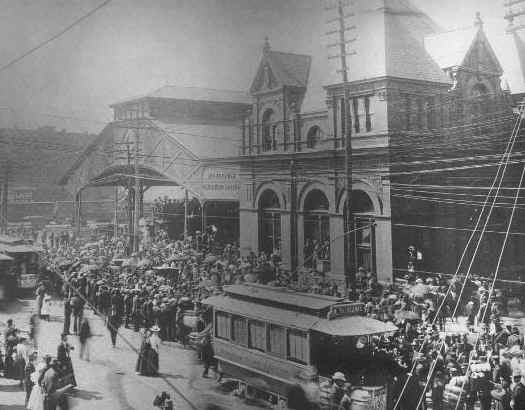 This image shows volunteers leaving for the Spanish American War, 20th St. looking south from Morris Avenue, Sunday, May 1, 1898. Published in Birmingham View, Birmingham Historical Society.